As we bid adieu to the Year of the Rooster and prepare to usher in the Year of the Dog, I would like to take this opportunity to wish everyone who is celebrating – a Happy and Prosperous New Year. This celebration is an important celebration for the Chinese community with thousands of years of history, a celebration so rich in tradition that begins with the journey back home for the all-important reunion dinner with the elderly and family on the eve of the New Year. Great emphasis is placed on the tradition of reunion during this festive period as it continues to embed and cultivate not just the values of filial piety and respect in the next generation, but also strengthens the relationship and bond of one with friends and family. This tradition, which has been practised from generation to generation for thousands of years, is indeed a respectable custom. It symbolises the concept of coming together as one. In Malaysia, religious and cultural festivals have become joyous occasions not just for any segments of the society, but they are celebrated by all. Perhaps it is the food, the culture and the laughter that unite us in festive celebrations like the New Year. But I believe it has been ingrained in us since Independence. We live harmoniously as one regardless of race and creed. It has become a way of life and this bond between us is what I believe to be the true spirit of 1Malaysia. This celebration is a perfect reminder of the many cultures and faiths that make us who we are as Malaysians. Our vast array of traditions and perspectives, our melting pot is what makes us unique, keeping us fresh and dynamic. Indeed Malaysia is home to many, and all have played important role in building this great nation especially our Chinese brothers and sisters as fellow sons and daughters of Malaysia. Their tremendous contribution is evident in every part of the country be it culturally or economically. To this end, my heartfelt gratitude goes to the nation-building role played by all Malaysian Chinese since Independence. I am committed to ensure that no Malaysians will be left behind, that the future of our children will be better than ours and that we will grow stronger and together as one. 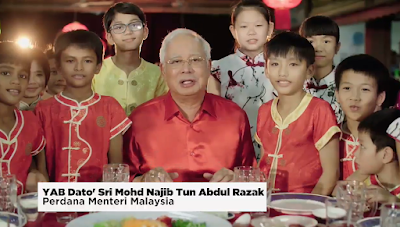 I hope that this Year of the Dog will bring prosperity and good health to you and your families and may we continue to be proud and committed to Negaraku, a country that we love.